Is it beginning to smell like Christmas, or is this post written a tad late? Anyway, this time round every year, many always find themselves at a loss of gift ideas to present to their dear ones. Depending on your budget and who's on the receiving end, choosing the appropriate gift can be tricky at times. Remember the book from your aunt that you hardly flipped, or the blouse from your friend that is a size too small? Now, you don't want someone else to receive white-elephant presents like you did, right? Macaroni House's bread pudding comes in 3 flavours (as far as I know): Original, Chocolate and Strawberry. As you can see in the photo above, I only tried the original and chocolate flavours. Since it is pre-packaged, Mac House decided not to put Butterscotch Sauce. Nonetheless, this one is soft and moist like custard pudding. I like the original flavour best, which had a nice liquor scent. 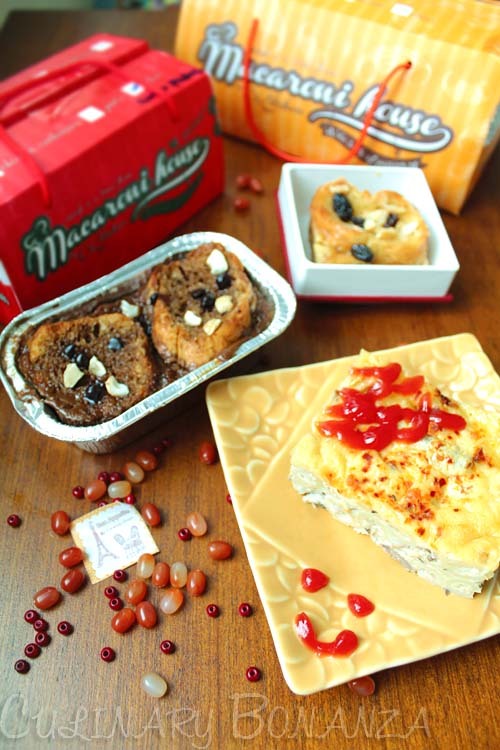 If you want something savoury, try some of the savoury baked macs like Grandma's Cheese or Fiery Fish Penne. Comfort food is supposed to be simple and Macaroni House does it simply right.